Over the years, men’s clothing has experienced a complete overhauling. With a host of different styles of wedding dresses and party dresses for women, men’s garments too has become very fancy. Today, a man is attentive to his looks when he goes for an office meeting or a party. 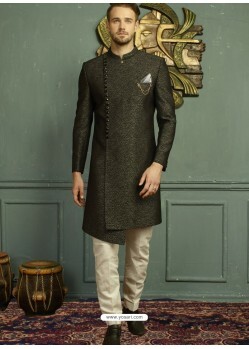 As every occasion demands a special kind of clothing, for a man, any type of celebration that holds importance gives him an opportunity to dress himself in gorgeous Sherwanis. 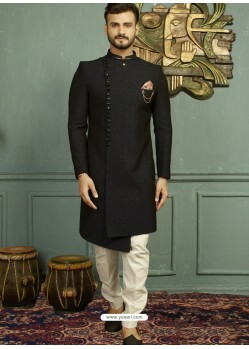 These clothes are so impressive that they surely make the man feel like a fashionable person, who knows how to carry himself confidently and is in love with Indian tradition and culture. What is so special about sherwanis? Sherwanis are exclusive garments and fall in the category of traditional clothing. 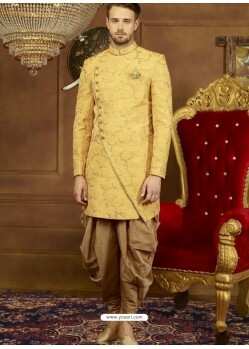 In India, their presence dates back to the Mughal era when royal subjects used to wear this clothing while attending the royal court as well as important functions. Even today, many officials of Pakistan can be seen wearing sherwanis while making their appearance in functions. 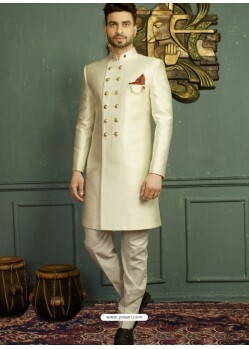 Sherwanis exude masculinity with a touch of royalty. The attire consists of a long coat, which goes much below the knees almost covering the calves. The lower garment is usually a men’s churidaar or salwar. The look becomes even more royal when it is worn with a dupatta and a turban. Color combination in sherwanis varies immensely. With new fashion trends coming in everyday, you could find them in almost every possible color. Traditionally speaking, most of the outfits sport red, green, or yellow colors. They are nicely teamed with pastel shades ranging from white, off white, cream, peach, light blue, sea green and so on. What are the different kinds of sherwanis available? 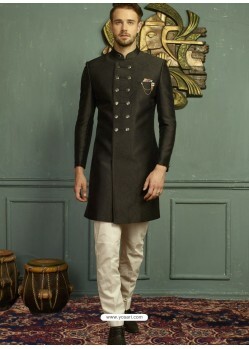 Although called sherwani, you will be fascinated to see its variety at YOSARI. 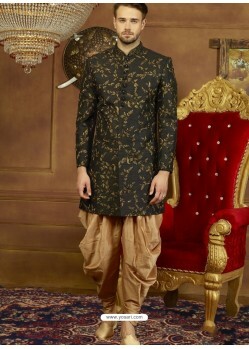 We have the collection of the most popular kinds of sherwanis. 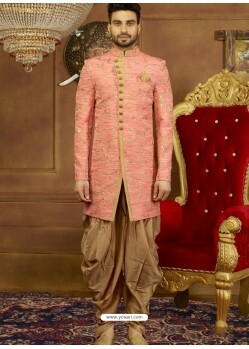 As the name suggests, this attire is especially for the bridegroom. It is a highly stylized garment with embellishments as in embroidery, beadwork, thread work, net work, zari work and so on. Generally, the look of the attire is kept traditional. 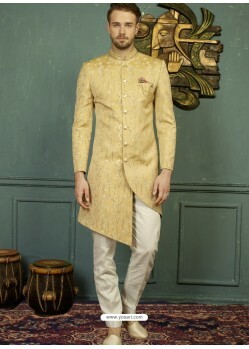 However, if you are the type, who would not mind experimenting a bit, you could go ahead with modern sherwanis. These outfits are made in such a way that will make you look leaner and thus, make you look taller as well. Furthermore, color combination can range from traditional to contemporary. YOSARI is the online spot where you can select your wedding look easily. 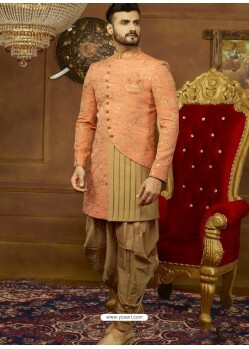 Our huge range of wedding outfits makes sure that you get the attire that you have been looking for. These outfits are simply awesome and can make every body type look attractive. Made especially by designers, these garments fit extremely well, which promises comfort for the man. Moreover, the shape of the outfit is customized to suit the body type of the man. In this way, his style quotient rises very high that surely grabs everyone’s attention. YOSARI brings the best designer sherwanis for every important occasion. Our garments are designed by trained designers, who ensure that the outfit is as per the latest fashion demands. They also design the clothes as per various body shapes of men and their heights. Therefore, you can stay assured that your positive physical traits will be highlighted with these outfits. Dhoti is a fully Indian garment, which can be seen in centuries old paintings and in some old photographs. It not only offers comfort but also lends the typical zamindar look. 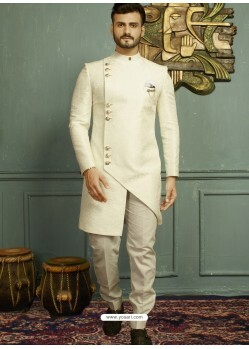 When dhoti is paired with sherwani, the result outfit is mind blowing. The look is worth a try, and at YOSARI, you can browse through a host of dhoti style sherwanis and add a twist to your look. Fusion fashion is here to stay and it is rocking the fashion world. 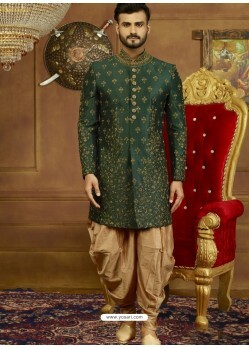 On the ramp, you can easily spot this type of sherwani. It gives the body a slimmer look and closely resembles well-fitted western suits. However, the classy Indian work done on them creates a nice Indian traditional look. It has mostly raised collar, which gives proper fitting to the shoulders and lends a confident demeanor. 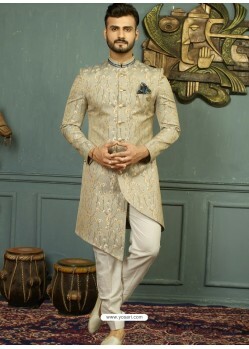 Which occasions are best for wearing sherwani? This garment is versatile and it will never make you look out of place. 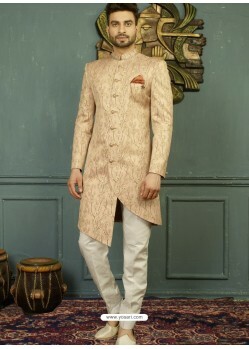 In fact, for every traditional ceremony, you could choose the sherwani look and be the cynosure. 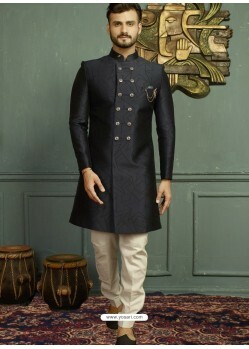 The most common occasions on which this garment is worn include weddings, engagement ceremony, raksha bandhan, navratri celebrations, Diwali, semi-formal and informal parties, etc. Why should you choose YOSARI? One of the foremost reasons is ease of shopping. At this shopping portal, you enjoy the unique liberty of shopping without disturbance. And, with the enhanced collection of garments here, you will never have to go anywhere else. We also make sure that the prices we quote are the best for you. In this way, you can be sure of getting the full value of your money spent. Not satisfied? Avail the 14-day replacement policy. Under rare circumstances if you do not find the item as you had expected it to be, you could simply return it to us and get your money back.